Do you have so many valuable or interesting moments you took with your AVCHD camcorder that you would like to share with your friends and family in YouTube, Google Video, Myspace or other video sharing websites? As you know, MTS/M2TS format is not supported on most video-sharing websites, You might need a video converter first to convert MTS/M2TS to workable formats online like SWF, FLV or F4V. 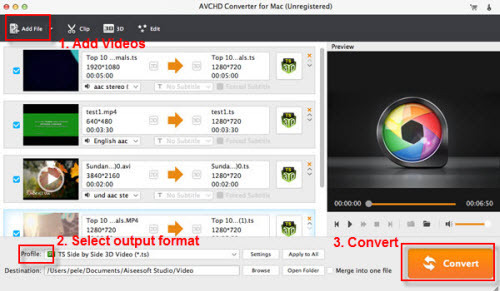 Here I’d like to recommend an excellent piece of MTS/M2TS converter - UFUWare AVCHD MTS/M2TS Converter for Mac. The program is specifically designed for MTS/M2TS converting which excels on output quality and its conversion speed. The following is the detailed steps of my own experience to convert MTS/M2TS files to SWF/FLV/F4V. There are four options under Flash Video catalogue for you to choose from: FLV, FLV H.264, F4V, and SWF format. Click the “Settings”, and a profile will pop up. You can adjust bit rate, frame rate, codec, etc in the window. You can lower bit rate to decrease output file size or you could enlarge bit rate for a higher video quality with comparatively larger file size. Click the Edit button in the menu bar, and you are allowed to custom your videos for special effects. For instance, you can crop those unwanted parts of your video, split your video into several clips, add text/image/video watermark and so on. After all the settings, you just need to click the Convert button and wait for a while to get your converted video files in destination folder for uploading to the website. See, it is easy, isn’t it? Hope it helps!